I almost ran out of time for Interactive Fiction with this year’s classes but then found a way into this very different kind of writing and reading. 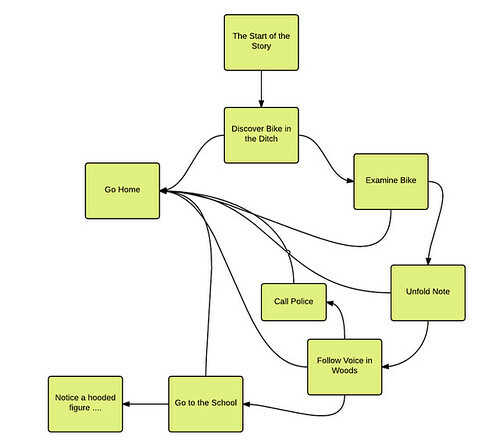 I had a two-day window to introduce the concept of Interactive Fiction — the kind of writing/reading where the writer leaves choices and the reader is in control. We read Make Your own Ending stories, and do a short writing activity where small stories are written with branches, and then shift to writing longer pieces. But it occurred to me that they already had a tool at hand: Google Slides. And we had already done much of the groundwork earlier in the year with Digital Poetry books. They knew how to add internal hyperlinks and create a network of paths. So, we dove into Google Slides to create some Interactive Fiction stories. They are not yet done, and even as we work on another story project to end the year (more later), the Interactive Fiction project is a nice extension project for my writers who are already finishing up their short story projects. I did share my own Interactive Story with students as an example. You play it, too, if you want. I’ll share out some of the story maps tomorrow … they are intriguing visuals of young writing minds at work.